Tron (TRX) has successfully completed the airdrop of 30 million Tron tokens to Ethereum holders. This is indicative that the Tron team is moving quite well in implementing its plans, as the main net launch date approaches. This seems to be driving the sentiment around Tron at the moment. In the last 24 hours, Tron (TRX), has been mentioned about 26 times on major online forums. Out of these mentions, 79% of them are positive. This means that after the airdrop, investors and crypto enthusiasts are optimistic of Tron at the moment. This surge in optimism is likely to continue to influencing the price action of Tron (TRX) in the next few weeks, as we approach the main net launch. For instance, in intra-day trading, Tron is in a consolidation phase. After a price surge yesterday during the airdrop, price hit some resistance at around $0.08206458 price level, at the 50-day moving average. From that point, it dropped to $0.07932946. This usually happens after major news announcement, and in this case Tron is no different. This drop was a period of profit taking, which explains why it has not been drastic. Currently, Tron (TRX) has consolidated and is oscillating between $0.07932946 and the 100-day moving average, which is acting as a point of major resistance. Looking at the other indicators such as the RSI, we can tell that this consolidation phase is being driven by investors taking advantage of yesterday’s price surge to book some profits. Currently, the Tron (TRX) RSI is trending sideways with a reading of 40. While this is a slight drop from yesterday’s reading, it is still in strong bullish territory. That’s indicative of the fact that the buying pressure is quite high, as investors move in to take advantage of the lower price. This increased volume is likely to push Tron upwards in coming hours. Once the upside momentum gains steam, 0.08172092 is likely to be the next point of resistance at the 100-day moving average. A break above this price level, could see Tron (TRX) get to $0.08460934 on its way back to $0.10. This momentum will continue to rise as the main net launch approaches. It’s simply a case of investors jumping in, to make the most of an upcoming price surge, which then plays a role to further push up the price. 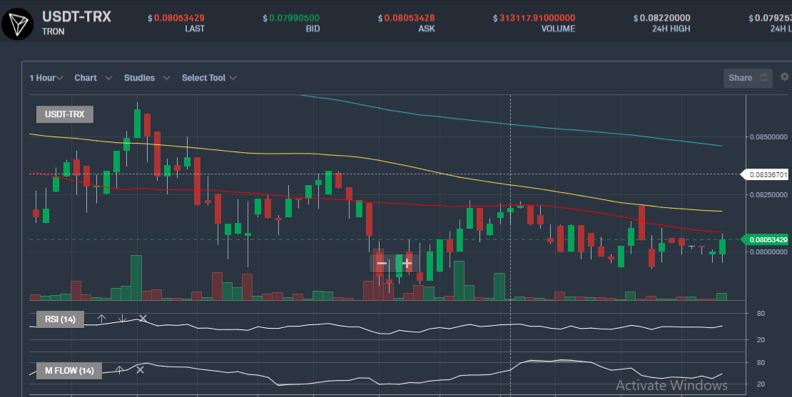 Tron (TRX) is consolidating after a few hours of profit-taking. Given that the overall investor sentiment in this crypto is positive, it is expected that volumes will continue to rise in coming hours, as investors move to take advantage of this dip, in anticipation of the main net. If you are looking to make an investment in Tron, this would be a great time to do so. The fundamentals are fully in support of Tron (TRX) at the moment. The short-term target is around $0.09 to $0.10, which is the level at which, Tron has experienced some resistance in the past.